Two millenium ago, a child was born in Bethlehem who taught us how to live. We have yet to heed his message of love, compassion and peace, but during this holiday season we should renew ourselves to that higher calling; to love one another as we want to be loved. The following conversation is composed of statements regarding peace from President Barack Obama’s Nobel Peace Prize Lecture (2009) and Dr. Martin Luther King, Jr.’s Nobel Peace Prize acceptance speech (1964). I was moved to write this because it was apparent to me from President Obama’s lecture that the simple concepts of peace and justice are made complex and exhausting. 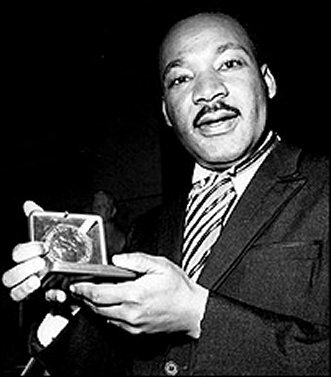 While he praised Dr. King’s non-violent movement, he alluded to the fact that he was a statesman and had to view the world as such; however, spreading peace and love knows no titles, positions, race, gender, sexual orientation, creed or class. We should be reminded this season that the only means of bringing peace is to live it. In Dr. King’s first book, Stride Toward Freedom, he wrote, “Contructive ends can never give absolute moral justification to destructive means, because in the final analysis the end is preexistent in the mean.” This holiday season let us reflect on the peace we seek to bring to the world and act in accordance. Happy Holidays. A conversation on peace between 2009 Nobel Peace Prize recipient President Barack H. Obama and 1964 recipient Dr. Martin Luther King, Jr..